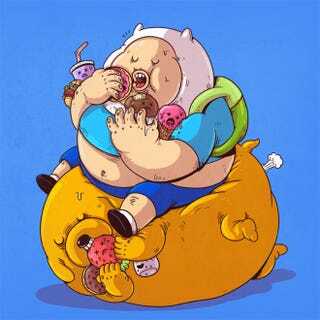 I had my doubts about these Botero-ish morbidly obese versions of iconic pop culture characters, but then you got me at Finn and Jake eating all those pastries from Candy Kingdom, Alex Solis. And Cookie Monster meeting its ultimate destiny, of course. Alex Solis is a Chicago-based illustrator who now works at Threadless. You can follow him on Society6, Cargo Collective, Facebook, Twitter, Tumblr, and Instagram.